Many thanks to Lee-on-Solent SC and all their wonderful volunteers who stepped in at very short notice to host our RS Aero UK End of Seasons, joining their new fleet of 13 local RS Aeros! The initial event had to be moved from Queen Mary due to low water there. 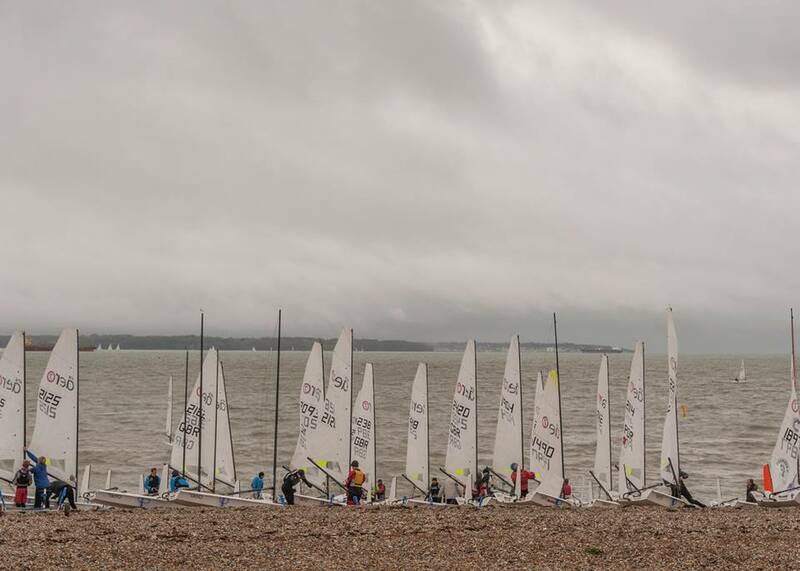 A splendid turnout of 35 RS Aeros enjoyed great racing with a full variety of conditions during the day. RS Sailing provided three charter RS Aeros that were sold out quickly to local sailors. It was great to have Ken Fowler of Race To Scotland join us for his first event in his high mileage RS Aero! It is always interesting to visit new clubs and see how the locals operate. Lee on Solent faces the prevailing south-westerly winds with waves from the western solent often rolling straight onto their beach. A benefit of the featherweight RS Aero is that two people can lift an RS Aero into the waves to launch and recover, removing the complication of the launching trolley in the surf and shingle. 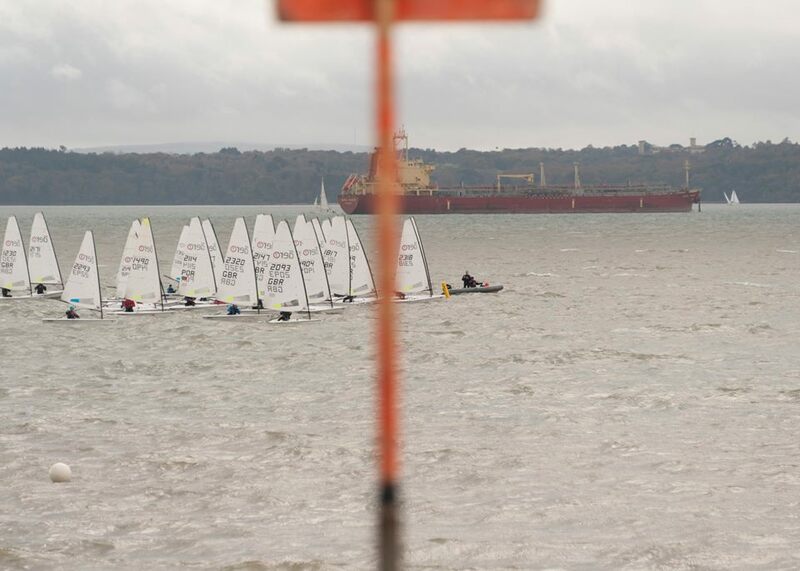 This is how Lee-on-Solent RS Aero fleet like to launch when the waves are rolling straight in. The day kicked off with Steve Cockerill and Peter Barton providing a 30 minute coaching session in the run up to the race briefing. These have become a regular feature before RS Aero open meetings and they enable local RS Aero sailors and new fleets to benefit from the techniques learnt in the new class over the past 3 years. With up to 20kn breeze across the course Race 1 got off to a blast reaching start, giving some interesting variety from the norm from the shore based start line. At mark 1 the fleet turned onto a beat offshore. Liam Willis (Lymington Town) led fast out of the blocks but was overhauled by Peter Barton (Lymington Town) on the two long broad reaches with some nice surfs to be had back towards the club. Peter held on for the win with Steve Cockerill (Stokes Bay) pulling through to 2nd and Liam 3rd. Race 2 gave a similar start with Liam and Steve neck and neck blasting to mark 1. Peter was 3rd having started to leeward. Steve showed his downwind pace catching waves to pull out a lead. The forecast was for a new lighter breeze from the north later in the day and this change happened on lap 2! With a big right shift those who had been protecting the right were rewarded to an early lay line or a fast reach in to the top mark. Steve held 1st. Peter cut the corner on Liam with the shift and in the final sprint to the line Steve Norbury (Warsash) took some new wind off the shore to come through to 3rd. Coming ashore for a tasty lunch allowed the RO to reconfigure the course. This time there was to be a tricky beat along the shore to mark 1. The tide was on the turn and the start line hard to judge. A crowded starboard end looked set to be a recall until the RO postponed to give the line a little more port favour. It didn’t look to have moved much and with the starboard end near to laying the top mark the fleet was tempted there. However three RS Aeros spotted opportunity down the line and John Warburton (Chew Valley) and Peter Barton successfully came off the port end. With the wind now down at 8-12kn it was a very different race to the morning. Chris Jones (Sutton Bingham) lead at Mark 1 and pulled away throughout the race to take the win from John Warburton in 2nd. Mark Riddington (Emsworth Slipper) took 3rd with Steve Cockerill pulling through to 4th to win on a tie break from Peter Barton. Steve Norbury took 3rd overall after the discard was applied. Top Youth was Liam Willis, 1st Lady Sarah Cockerill and Steve Cockerill also took 1st Master. Andrew Frost was 1st out of the RS Aero 5s with a 5th in Race 1. 1st home RS Aero from Lee-on –Solent was Fernando Gamboa who had the initial idea to bring the event to Lee – Thank you Fernando! This was the final event of 10 in the Magic Marine RS Aero UK Southern Circuit and that prize giving followed the daily prize giving. 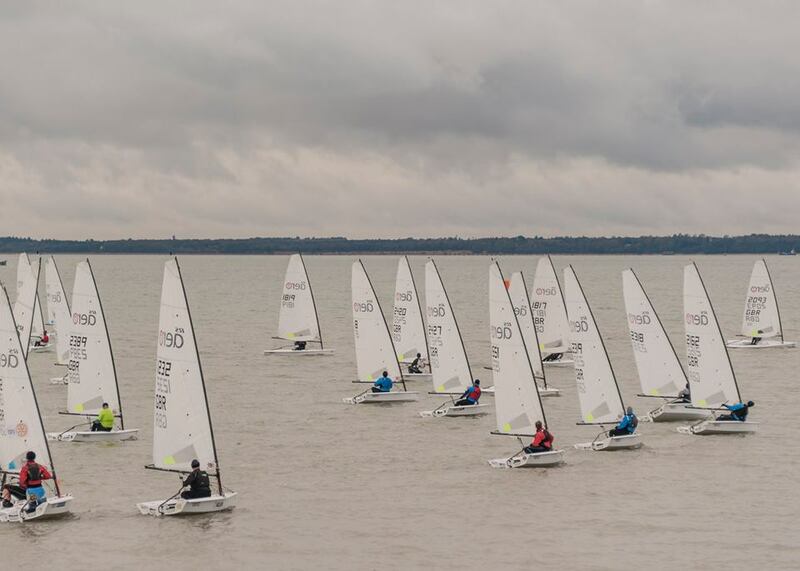 Next up in the UK this Winter is the RS Aero Winter Series which will be up to 10 events chosen from some of the most popular mixed class winter events, spread around the country and starting with the Brass Monkey at Yorkshire Dales SC on 27th December. The RS Aero Winter Training has 6 weekends scheduled, one a month from November to April, and kicks off at Oxford SC this weekend, 18/19th. The Rooster RS Aero UK Youth squad will be at all six Winter Training weekends and these are also open to all - so locals, neighbours, and parents are all welcome! Full details via the RS Aero UK events list. *Results have been amended slightly after including the discard. Some changes from 3rd downwards, the biggest mover and shaker being Steve Norbury, who jumps up to 3rd overall!